This activation was on my list for a while, it’s an “easy” access summit with a lift to “near” to the summit. 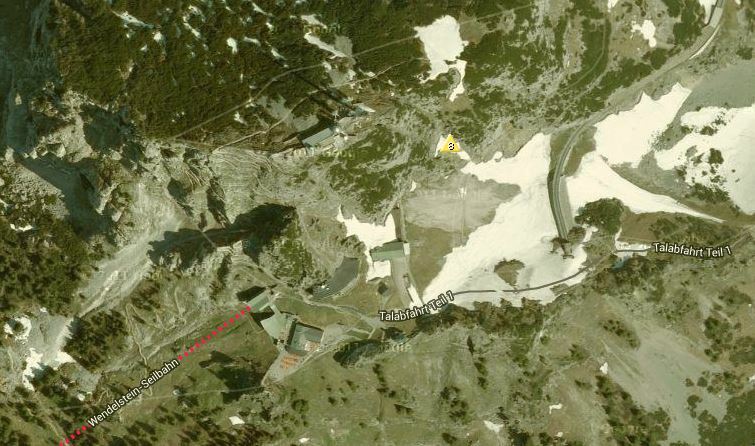 In this case there is a cog-wheel railway as well as a cable car that brings you to the “berg staton”. 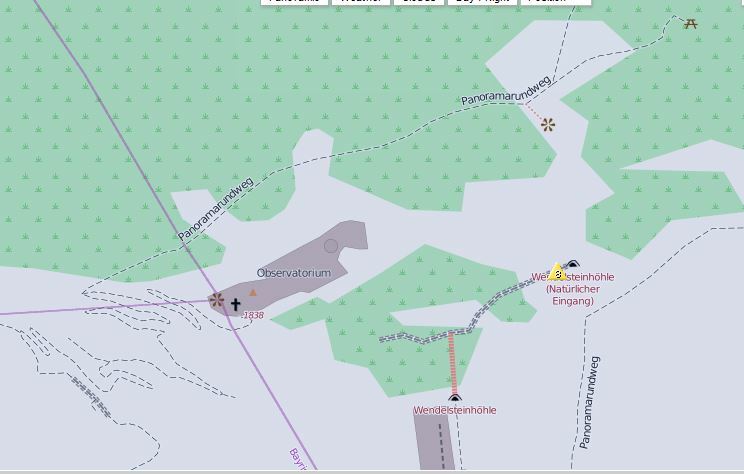 Once at the “berg station” there is a serpentine track up to the actual summit about 100m higher than the top stations of the cable car and cog railway. The space observatory is located on the summit but is not accessible to the public. The path is made up of a few steps and some long light climbs. It takes around 30 minutes to climb the track to the summit. Wendelstein attracts a lot of people probably 25% of them head up to the summit, making it a busy place with limited space. Hence this activation needed a light configuration that should take up minimum space – so no squid-pole based dipole antenna, rather a Diamond RHM8B HF whip on a tripod with a counterpoise wire. The trip down was planned to take 2 hours and meet the 12 noon train (it only runs on the hour) allowing a little extra time in case of traffic delays (a useful point as it turned out). Wendelstein can be approached either by the cable car that starts near Bayerischzell or using the cog railway from Brannenburg. The cable car only takes 7 minutes to reach the summit while the railway takes 25-30 minutes. The railway also costs €10 more for a return ticket than the cable car – €31 – really expensive! However the unique ride up the railway is special with the views you get. Brannenburg is easily accessed from the Innsbruck autobahn while access to the cable car requires some cross-country driving using smaller roads. Once on the summit there are a few attractions – a restaurant with inside and outside seating, a lookout point, a small chapel, which is consecrated so it is the highest point in Germany where someone can get married. A small underground mine / display area, the Bavarian TV transmitter station and a small observatory. Apart from the observatory all attractions are located near to the railway and cable car stations and the restaurant. The observatory is located near to the summit which also has a cross, another small chapel and two lookout platforms. There is an extension to the track up to the summit, that continues around the back of the mountain, giving panoramic views and returning you back to the restaurant / stations. The track from the cable car and railway stations to the summit is achievable by most people and has hand rails all of the way up. Our schedule was somewhat regulated by the hourly schedule of the train and it was good that we allowed some extra time for the trip as several farm tractors were underway on some of the roads that we needed to use as well as road works on the autobahn causing an additional delay. We did arrive in good time to meet the noon train to the summit from Brannenburg and it was a lovely trip up the mountain as shown by the photos in the slide show below. Arriving at the top station we decided to get something to eat before doing everything else to avoid the lunch rush. This went well and indeed by 12:40 I was ready to start the trek up to the summit. While the climb up winding path was an easy climb, the path seemed to never finish. As you get to a point where you think you are getting close around the next corner the path goes out across the next cliff face into the distance! The path is narrow so stops to allow people coming down to pass also took up time however as I was running well ahead of my schedule this was not a problem. On arriving at the actual summit, the number of people increased – there were about a dozen there however all had chosen the lookout platform with seats near the observatory on the right, so I quickly took up residence on the lookout platform past the summit cross and small chapel on the left. This is a platform made up of concrete tiles, so the tripod with the Diamond antenna attached sat well on this surface. I set up as quickly as I could while the space was available. While setting up a dipole on a squid pole may have been possible by lashing it to the railing surrounding the platform, the tripod and vertical approach was certainly quicker to install. There remained one problem, with the relatively small area, there was not a lot of space for the counterpoise wire but I managed to lay this out and taped the plastic reel on its end to the railing keeping it elevated about 1m above ground at the end. This also did not take up too much of the platform.Given the small area available I chose to go on 20m (with its shorter counterpoise wire first) and while the SWR was not as good as I had achieved during testing, I decided to use the antenna in any case and hope I would be able to get out OK.
On tuning around to find a free frequency I came across Hans on LA/TM-001 calling CQ SOTA. After a persistent call, stressing “Summit to Summit” I managed this contact into Norway. Not bad for this set-up I thought. I then found 14.275 apparently free and put out a QRZ to check it was free to have Nobby (G0VJG) operating as GJ3RCV (Cray Valley radio society) come back and say he was monitoring the frequency and waiting for the IOTA contest to start. Nobby and his team were on the Minkies reef off Maitresse Ile in the channel islands which I believe he said was only 25m wide by 70m long. This was another interesting contact which proved the QRP equipment was working well. 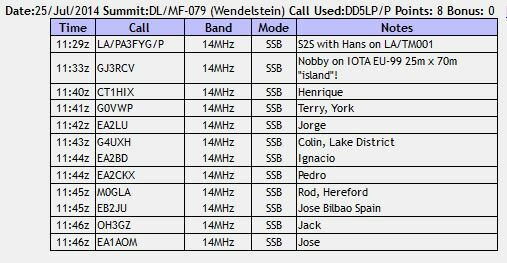 After eventually finding a free frequency and self spotting a further 10 contacts were made on 20m (see log below). Once the flow of calls stopped, I decided to try 40m and detached and rolled up the 20m counterpoise and installed the 40m one as best I could in the limited area. At this point a wedding party in full Bavarian costume arrived and started taking photos by the summit cross (on “my” platform). After adjusting the Diamond antenna for best VSWR, I tried tuning 40m – and found S9+ noise right across the 40m band. Given its strength I presume this is local QRM either from the weather station or the TV station on this summit. It made 40m totally unusable. As I was now feeling quite cold and felt a few spots of rain, I decided to pack up and head back down the track to the warmth of the restaurant and to take the earlier train back down the mountain. As always when half way down the climb, three additional activations were spotted on SOTAWatch that I probably would have been able to contact for S2S points. While this was a good activation with some good contacts, I am not happy that the VSWR was higher than during the antenna tests earlier in the week. It could be that all of the metal work around the platform caused the issue or that because I was on a concrete platform, not directly on solid ground that the antenna didn’t tune as well as expected. In any case some more tests and possibly a quicker “clip-on” method needs to be found to attach the individual counterpoise wires to the socket base (presently I remove the nut, attach the wire and add the nut back – if I had dropped the nut between the concrete tiles on the summit, the activation would never have taken place). When reducing items to cut down on weight DO NOT remove gloves from the pack! (It was cold on the walk up to and on the summit platform). This entry was posted in SOTA and tagged DL/MF-079, SOTA, Wendelstein by VK2JI DD5LP G8GLM. Bookmark the permalink.